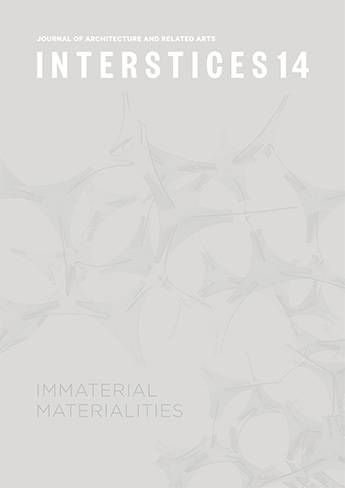 The collection of essays and visual essays in this issue explore materiality in relation to ideas about interactivity and how these have manifested themselves in art and architecture. Interstices 14 builds upon ideas and issues identified by a host of international guests at the Interstices Under Construction Symposium held at the Australian Institute of Architects in Sydney in November 2012. It endeavours to untangle tropes such as digital materiality, material agency and immateriality across an interdisciplinary field comprising architectural history, art history, curatorial studies, and art and architectural practice.